I have always liked to give my characters control over the story. I know the main plot when I start a book but not how the crime will be solved, or even how the heroine and hero will meet. y, I sit down at the computer and just start typing, allowing words to flow and learning as I go how the story will develop. Lately, I’ve found that the characters have become a little bolder, a little more opinionated, and go off in such wild directions and tangents I have no idea how to get them focused on the story I intended to tell. Sometimes it’s good as the book is enriched by interesting details I didn’t know, and my characters end up in some great situations I need to get them out from. But other times, it becomes a real problem. The characters throw in so many twists and turns into the plot, it’s no longer recognizable to me and becomes too farfetched. Once I let them loose it’s hard to rein them back in. While I complete the book, after typing “The End” I’d find myself needing a lot of time to edit to make everything cohesive and work for the original storyline. I like giving the characters control, but I realized I needed to keep some of it for myself as allowing the characters to “rule the roost” resulted in a lot more work for me. I’m trying to ‘write smarter’ by making sure there are some established “rules” for my characters while still allowing them a little freedom. I don’t want to totally control their behavior as some of my best scenes, and the biggest “wow” moments, have come from letting the characters decide what they want to do and say. I’m doing some basic outlining now, and it allows me to have the right balance I need for my writing process. The story moves forward in a natural way, and the characters can still act “spontaneously”, but I have an idea on where the story is going and what will happen. I just don’t know the actual words, and sometimes actions, the characters will take to get there. 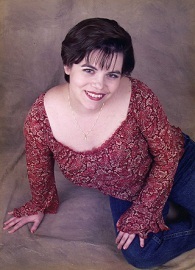 Christina Freeburn is the author of the New Beginnings Series published by Desert Breeze Publishing. 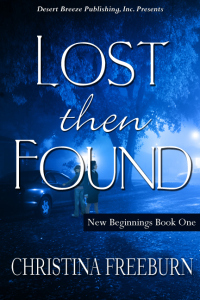 The books in the series are: Lost Then Found, Led Astray, Safe and Sound, Long Gone, and Far and Away. She is also the author of the Scrap This Mystery Series published by Henery Press. Christina is a full-time writers and focuses on stories with characters, especially heroines, overcoming their pasts and striving to help the down-trodden turn around their lives. The stories are sometimes told with humor, other times serious, but always with heart. This entry was posted in Book Tour and tagged Author Christina Freeburn, Author Michele Seigfried, Book Tour, christina freeburn, guest post, romance novel. Bookmark the permalink.